Leftover holiday ham and butternut squash, perfectly repurposed for breakfast. In a mixing bowl, combine the squash, half-and-half, sugar, and cinnamon. Add the flour, baking powder, baking soda, salt, and the butter into a food processor and pulse until mixture is crumbly (alternatively, this can be done in a bowl with a pastry cutter). Add the flour-butter mixture to the squash mixture in the bowl. Stir with a fork just until flour is moistened. Turn dough out onto a lightly floured surface, and quickly/gently form into a 1-1/2-inch thick disk (see Notes). Cut with a 2- or 2-1/2-inch biscuit cutter. Place biscuits on a baking sheet. Bake at 450 for 10-14 minutes or until golden. Remove from the oven and brush with melted butter. Makes 10 biscuits depending on the size biscuit cutter used. While the biscuits are cooking, prepare the Dijon Cream Gravy: cook the butter and flour together over medium heat for a minute or so to make a roux. Add the half-and-half and cooking, stirring, a couple minutes until thickened. Remove from the heat and add the salt, pepper, and Dijon. To serve, put the bottom half of a biscuit on a plate. top with ham, and over-easy egg, and Dijon Cream Gravy. 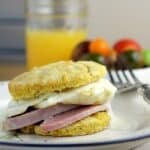 Place the top biscuit half on top and serve. Yields: 10 servings. In making the dough, there are a couple tips. First, once the dough is turned out onto the floured surface, you do not want to over work it or the biscuits will come out flat and tough. Also, the exact shape of the dough "disk" is not important either. What is important is just to work quickly so the butter doesn't warm up. Knead the dough a couple times, if needed, to get it to come together, then quickly use your hands to flatten it out. Also, these biscuits will not rise substantially so take care not to press the dough too thin to begin with.